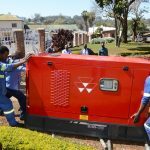 Malawi is going through massive power cuts due to the low water levels in the Shire River, which is the source of hydro-electric power throughout the country. The increased load-shedding has affected homes as well as business. The Bible House has, on average, three days of regular power. 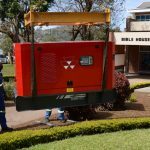 In order to mitigate the power problem, a 33kVA generator has been installed at Bible House. This has made a big difference in the day-to-day activities as work continues without power interruptions. The installation of the generator was done through the Stepping Stone Project funded by British & Foreign Bible Societies (BFBS).